Need Some Art? What to Help Support the Kerouac Project? Court Tree Gallery will be donating 15% of the gallery commission on the above piece titled “Skid Row Wine” based on the poem of the same title. The painting is offered for $2,850. Interested parties can contact Stephen here. 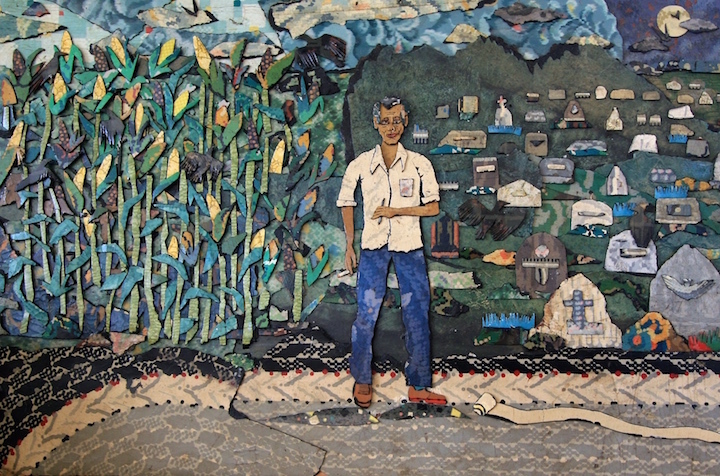 Bill Miller builds assemblages of recycled linoleum flooring that rely on the flooring’s found surface to render its subjects with no added paint. His images range from bucolic landscapes to surrealistic, fiercely political pieces that draw on iconic news and pop culture images that have informed society’s common memory. His unexpected use of familiar patterns taps into the medium’s nostalgic qualities, imparting a sense of personal history and rediscovery within each piece. Miller was commissioned to create two posthumous album covers for Frank Zappa, the 2012 Woodstock Film Festival poster and has been published in the New York Times, Chicago Tribune and the coffee table books, Found Object Art 2 and recently ReTrash among others. His work has been widely exhibited in the U.S. as well as in London and Spain.